The long-billed corella is easily recognized by it’s long pointy bill. This species has white feathers with an pink edge along the bill, eyes and throat. The crest is white and very small. The scientific name for this species is Cacatua tenuirostris. 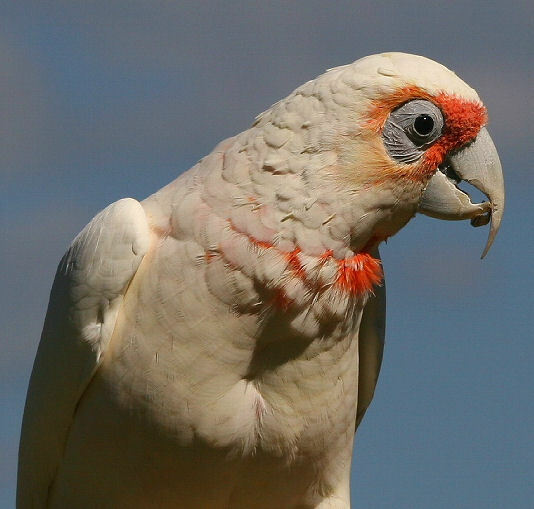 The long-billed corella is native to Australia and is common on the Northern coast. They live on grasslands and open fields. They are getting more and more common in urban areas as well. In Australia this species of cockatoo is common as a pet, while in Europe it is much less common. This largely has to do with its availability in Australia as it is a common natural species. As a pet they are affectionate, playful and generally very nice pets. As any species of cockatoo they can make a lot of noise and like to chew at things. They can imitate sounds and speech better than most cockatoo species.